In April 2013, after a humiliating 3-0 home defeat to Sunderland, one intoxicated Newcastle fan gave us one of the most iconic moments in Tyne-Wear derby history. 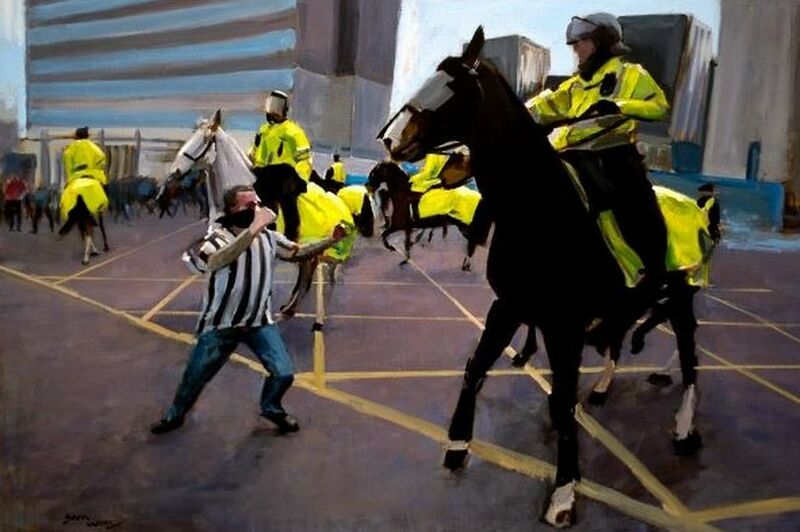 Furious with his team's performance, and apparently with the police force keeping fans in order in the surrounding area of the stadium, one Geordie decided to take his anger out on a police horse by punching the animal called Bud. The culprit pleaded guilty in court and was sentenced to one year in jail. The bizarre nature of the event makes it one of the most shocking and most memorable moments in Premier League history. And someone has immortalised that moment on canvas. Young artist Sam Wood has painted the famous moment and is selling his masterpiece for £1,010. “It was an amazing image and one that stirred a lot of emotions,” said Sam. It is one of a collection of his recent paintings which will preview this week on Friday, September 7 until September 15. Sam works with oil paint and produces paintings that depict the conditions of city life. There will be around 15 works on show at the @24 High Bridge gallery in Newcastle which range in price from prints starting at £40 to his larger oil paintings selling for hundreds of pounds. It is Sam’s largest solo event to date, having had his work on display at various galleries across the city including the Biscuit Factory.